There are many different ways of layout out your store and displaying merchandise. One great solution for stores with attractive or valuable goods is to use display cabinets. Glass and acrylic display cabinets can boost the appeal of Brisbane retail stores of all descriptions. There are many different types of cabinet, from tall free-standing towers to counter-top displays, to suit retailers ranging from grocery stores to upmarket fashion boutiques. Benefits include making products look more attractive and keeping them secure. With Brisbane’s high street’s booming with a diverse assortment of shops, stay ahead of the game by making your merchandise stand out in display cabinets for your Brisbane store. With a plethora of high streets, market squares and shopping centres, Brisbane has developed a reputation as something of a shopper’s paradise. It’s the retail capital of the Queensland district and one of the most popular shopping regions in Australia, with millions of locals and tourists flocking to stores to purchase quality brand goods and take advantage of special offers. Queensland has been leading Australia’s retail boom, with retail spending higher in the territory than anywhere else in the country. Brisbane has been at the forefront of this growth. Paddington – the place to go if you’re looking for local or artisan boutiques. The Given and Latrobe terraces are home to independent retailers including jewellers, antique stores, fashion boutiques, homeware and arts/crafts. Fortitude Valley – a district filled with trendy stores, clubs, restaurants and more. Westfield Chermside – the largest shopping centre in Queensland (and 2nd largest in the whole of Australia) with over 500 retailers and a 16-screen cinema complex. The City – the shopping central point, with high streets and hidden laneways filled with over 1000 stores including numerous flagship boutiques. 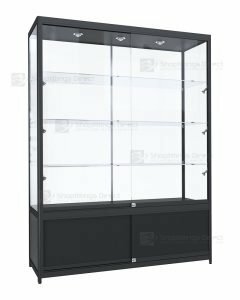 Whether you’re a Brisbane trader dealing in sports equipment, bakery, electronics goods or anything else, you can find suitable quality display cabinets to brighten up your store. Cabinets are made from either strengthened glass or acrylic, usually with display shelves inside. They range in size, from multi-stacked towers to individual counter display cases, and can be frameless or aluminium-framed. For added security, most cabinets have a lock feature on the door and they can be fitted with lighting to enhance displays. Point-of-sale counter-cabinets – these can be full view glass display counters or combination counter cabinets. These display units enable retailers to turn their store counter areas into attractive display units so shoppers can browse while they wait to make their purchase. Corner showcase cabinets – small 90-degree cabinets that fit nicely into the corners of your store so that you can maximise retail space and create attractive browsing features. Tower cabinets – these can be either framed or frameless with 5-6 glass shelves so that you can utilise extra display space. Units can be fixed to the wall or free-standing in the middle of the shop floor. Mirror-back cabinets – can be used with LED lighting to create an extra glow and enhance the visual appeal or valuable or rare items. Large aluminium-framed cases – available in different sizes and dimensions. Suitable for large displays. 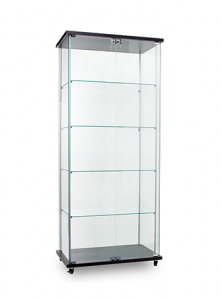 Trophy cabinets – can be used by retailers as well as by schools, clubs, offices, etc. to display awards and memorabilia to visitors and the general public. Wall cabinets – smaller framed cabinets that fix to the walls and display products at eye level. Frameless glass cubes – elegant and innovative toughened glass cubes are available in anything from single cubes to 12-cube mega-showcases. Acrylic display cases – an alternative to glass. Smaller models can sit on the counter while bigger multi-shelved cases can display goods on the shop floor. Display cabinets for shops come with either hinged or sliding doors, usually with a security lock feature. Display cabinets are shop fittings that have a great many benefits. Here are a few reasons to consider investing in them. With so many different models on the market in a variety of styles and sizes, display cabinets are suitable for displaying a wide range of small and medium-sized products, from jewellery and ceramics to designer clothing accessories to artisan baked goods. They’ve been popular as a shop fitting option for a good while, too, so won’t go out of fashion. Which means that you’re likely to generate extra sales. The design of the cabinets encourages more creative thinking in shop displays as it’s not just about stacking row upon row of products in a uniform way. The additional options such as LED lighting or mirrored interiors can be used to create attractive showcases that will lure in the shoppers. The appearance of glass display counters adds a touch of sophistication and elegance to stores, which in turn influences the behaviour of shoppers. Whereas casually-stocked or over-crammed shelving displays can lead to customer behaviour being messy or inconsiderate, elegant cabinet displays give off a more ambient vibe with a more measured “look but don’t touch” attitude practised by shoppers. With goods kept at all times behind a locked screen, you don’t have to worry about things getting stolen, broken, misplaced or shop-soiled. Handling of merchandise can only be done under staff supervision so it’s one less thing to worry about for shop owners. As the insides of the cabinets are not so exposed to the elements, they won’t get as dirty or dusty as shop shelves or other display units. These means less time spent having to clean them. Just a quick wipe down with a warm damp cloth once a week should suffice for the inside surfaces, while the glass and acrylic exteriors are easily cleaned and stain resistant. Cabinets are made from toughened glass so they won’t break easily. They’re also scratch resistant so should be easy to maintain in good condition if you’re careful. The acrylic units are even tougher and more damage-resistant than glass. An added benefit is that customers generally perceive display cabinets to be more fragile than standard shelving so are normally extra-careful around such displays. Jewellery stores – Brisbane jewellers can use a range of cabinets throughout the store for earrings, necklaces, watches and more, including counter displays, window displays, free-standing units and wall displays. Electronics stores – how about a futuristic-looking glass cube display to show off the latest tech gadgets? Gift, craft or model stores – can display rarities, one-offs or expensive products in an eye-catching tower display cabinet somewhere close to the entrance to entice customers. Hardware stores – can use a point-of-sale counter-cabinet to showcase expensive or latest model tools and DIY products. Bakery stores – artisan bakers or cafes in Brisbane can place cakes and other baked goods in fetching acrylic display units. Fashion or sports stores – can arrange exclusive or new range merchandise in a strategically placed focal display. The cheapest option for buying displays is second-hand. You can find them in stores as well as on sites such as eBay. New products can be sourced from various stores including online stores such as Amazon. The best place to shop for them is through a professional shop fitting service who will have a more extensive range of up-to-date equipment, usually at reasonable prices, and will be able to give advice on the most suitable equipment. Shopfittings Direct is a professional supplier of retail shop fitting and shelving products to stores all across Australia. 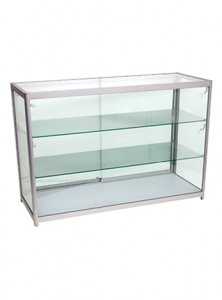 We have an extensive range of products including an assortment of display cabinets for sale. Call us on 02 9608 5122 or email sales@shopfittingsdirect.com.au for more information.